How Can I Get Rid of Bleach Stains on Unglazed Ceramic Tiles? Ceramic tile is one of the most common tiles in the household today. Aside from the diverse variety of prints and patterns available in ceramic tile, it's also one of the easiest floors to clean. Unless the stain is bleach. Prevention is better than a cure, so when working with bleach even around unglazed ceramic tile, make sure to allow proper ventilation, proper containment and ample distance between pure bleach and the ceramic tile. Often, stains occur while trying to clean the floor as a result of mixing bleach and water over the tile, or mixing too much bleach into the water. A mixture of 1 part bleach to 3 parts water is correct for use on ceramic tile. Lay towels down around any buckets or bottles, and if working on walls, make sure to lay down a tarp. If bleach falls on your ceramic tile, time is a crucial factor. Removing it quickly using one of these methods can save time, money and frustration. As a first line of defense, it's a good idea to keep a can of club soda and Magic Erasers (Mr. Clean makes the name brand) handy. Get to the stain immediately and pour club soda over the affected area. Then scrub vigorously with the magic erase. The stain should lift before the bleach can gain a foothold. If the bleach stain is a small one, use hydrogen peroxide. Hydrogen peroxide is a well known stain fighter and works on most household stains including many bleach stains. Soak a cloth with it and lay it on top of your unglazed ceramic tile. Leave it there for six hours, or overnight, then remove. If the stain remains, reapply. For the larger stains, you might need to use something with a bit more power. In these cases, you can make a poultice (a medicinal paste). Mix together 1 part hydrogen peroxide, 1 part baking soda and 2 parts cream of tartar (the kind you find in the grocery store.) Mix together briskly and apply over the affected area. Leave for 24 to 48 hours and remove using conventional floor cleaner. If portions of the stain persist, reapply for up to another 48 hours. For severe stains where the poultice is ineffective, it may be possible to sand out the affected particles. 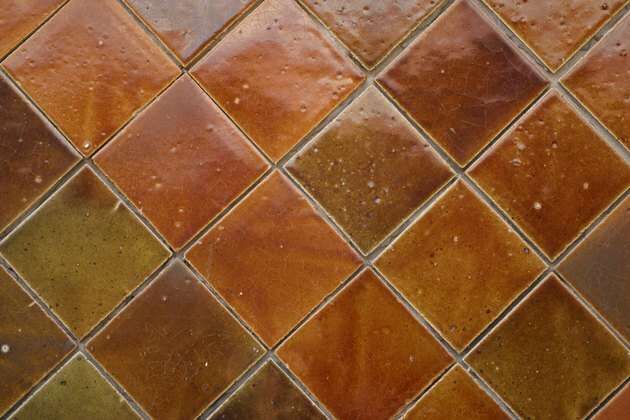 This trick will only work on unglazed ceramic tile, and may cause mild discoloration in the affected area. To sand out a bleach stain, take extra fine grain sand paper and move it in gentle circles over the affected area. Continue for up to 15 minutes but stop if you notice a powder forming in the color of your tile on the paper. Do not sand vigorously because it can damage or destroy the tile.